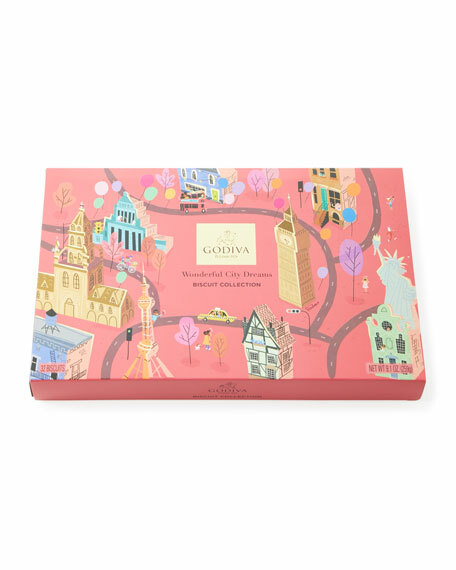 The beautiful, 32-piece Biscuit Gift Box, featuring a new design by French illustrator and comic designer Pénélope Bagieu, is filled with crisp and buttery biscuits touched by unmistakable Godiva chocolate richness. 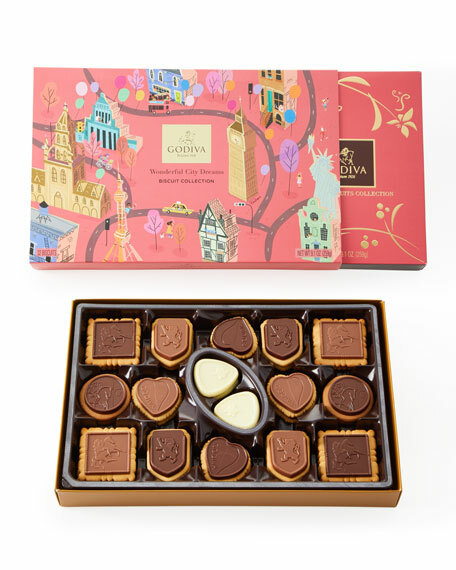 Flavors include Dark Truffle Heart, Hazelnut Belgique, Chocolate Lune, Petite Mousse, Raspberry Chocolate Premiere, Godiva Signature, and Hazelnut Praliné. 11.4"W x 7.4"D x 1.5"T.
Allergen Information: Contains of wheat, milk, coconut, hazelnuts, egg, and soy. May contain other tree nuts and sesame. For in-store inquiries, use sku #2578654.